At pp. 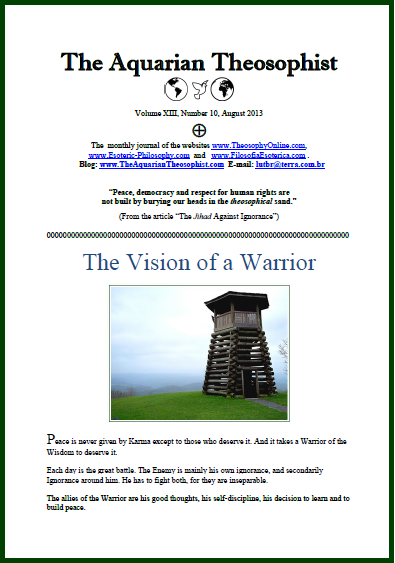 1-2, the note “The Vision of a Warrior” examines the fact that “peace is never given by Karma except to those who deserve it, and it takes a Warrior of the Wisdom to deserve it”. On page 2, we have “The Art of Finishing Something: There Is a Time for Everything in Life”. “On the Souls of Esoteric Books”, “The Art of Sleeping Well”, and “Lessons From the Night Sky” can be seen on pp. 3-5. The article “An Egyptian Mystery” makes an examination of the present Middle East situation (pp. 5-7). Then there is a note by Robert Crosbie entitled “How Many Theosophists?”. Effectiveness counts, while quantity often makes no difference. One of the highlights of the edition is on pp. 8-9, under the title “The Jihad Against Ignorance – a Campaign Promoting the Ethics of Islam”. On p. 10, a note discusses the dangers of personal comfort. Page 11 shows an article on the question of time, agenda and priorities. On pp. 12-13, it is demonstrated that the well-known Adyar “clairvoyant” Geoffrey Hodson – who piously believed Charles Leadbeater’s frauds – taught about a physical plane civilization on the planet Mars. The August edition presents Steven H. Levy’s article entitled “Companions in the Struggle of Life – Examining a Diagram in The Secret Doctrine” (pp. 13-16). A fragment by H. P. Blavatsky shows How to Obtain Self-Knowledge. A brief note refers to the esoteric dimension of the works by Jorge Luis Borges. The 18 pp. 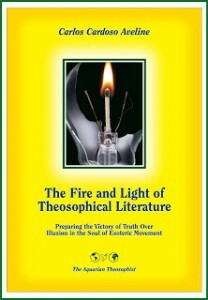 August edition concludes with the List of New Texts in www.TheosophyOnline.com and associated websites.